The Downeast 40 looks similar to the Passagemaker 40. The bridge is different and the windows are different but the hull is the same. And, the interior plans are different. The owner's cabin is aft, with a bathtub! and the guest cabin is in the bow. The Passagemaker 40 was first built in the early 1970s in Tiawan (hulls 1 and 2) however, quality was not up to DeFever standard so Jensen Marine in Costa Mesa, California, was selected to build the 40 using new tooling. After 132 boats were built by Jenson, the tooling was sold to DownEast Yachts in 1976. All DownEast boats were built in the USA. The Passagemaker 40 and DownEast 40 were the first "mass produced" boats with the DeFever name. The quality of the American-built boats far exceeded that of foreign-built boats of this size during that era, and helped establish the DeFever name as a quality boat. 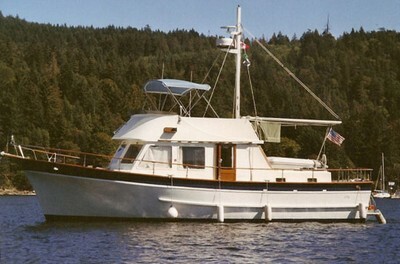 The Downeast 40 was built from 1980 to 1982. Usually powered by a single Lehman 120 hp diesel, or Perkins diesel, with 450 gallons of fuel, these cruisers will travel 1,000 miles at 7 to 8 knots.